A six piece band that is more then just the sum of its parts. 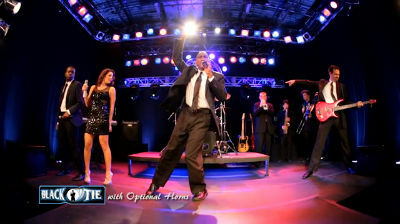 What distinguished Black Tie from other variety bands is their boundless energy and charismatic stage presence. Playing current radio hits as well as danceable songs from the 60’s to the 2000’s, Black Tie’s ability to recreate any genre is unmatched in the industry. The core group is powerful, but adding horns, strings, and/or percussion can make the impact even greater. With well over 1000 performances over the past 20 years Black Tie knows how to move an audience and will work with you to create the perfect entertainment experience for your guests. The band has performed for The American Heart Association, Georgetown University, Xerox, the National Association of Home Builders, Ace*Com, PWC, Target, OPNET, XIOTech, AXA Advisors, Maxell, ReMax, RCI, Booz Allen, Holy Cross Hospital, and many others. For an unforgettable entertainment experience, Black Tie should be your first choice. With more than 1000 events under their combined belts, BLACK TIE is stronger than ever. Like Us on Facebook!